Do you have a small array of fish you keep as pets? While large, multi gallon fish tanks are aplenty and nice aesthetic, you don’t need to waste energy, money, and resources on something that’s too large. 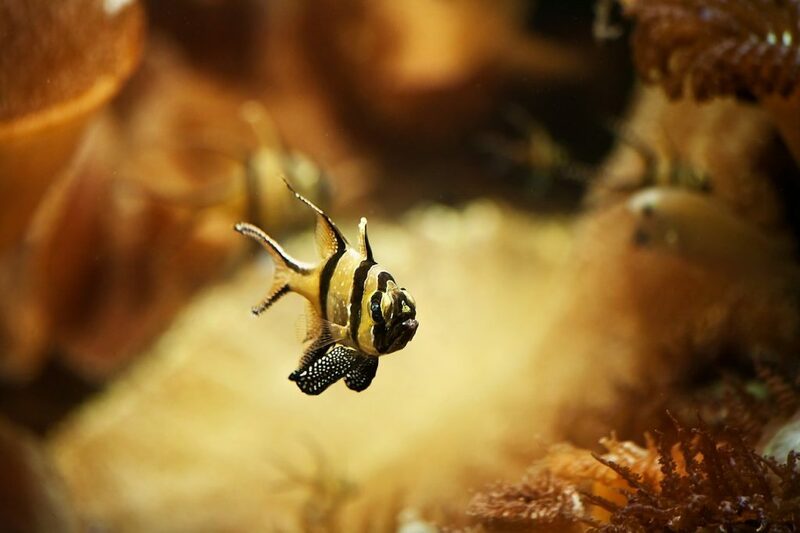 Just as well, your fish and other aquatic life forms need plenty of room to swim freely in their home without being cramped by their own walls or other fish. The solution is the moderately sized 2 gallon fish tank. 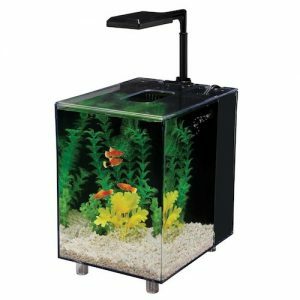 It’s one of the small fish tanks out there that you can purchase and is perfect for a couple of small fish to live happily and healthy in your home. Most fit comfortably virtually anywhere in your home and will provide a nice corner of the world for your aquatic freshwater fish, saltwater fish, tropical fish—you name it—to thrive. 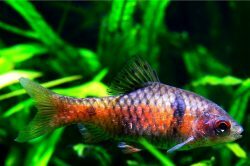 So considerations to keep in mind while going through this list, however, include a lot of personal choices for your fish. The below 2 gallon aquariums vary in shape, though they all hold the same amount of water. The way it’s distributed can be very important. There is also varying degrees of light fixtures for the tank that provide different levels of intensity and color. A big thing, as per the safety of your fish, is the output current on the filters. Some are more powerful than others so keep that in mind while looking at the specs on the filtration system on these small fish tanks. 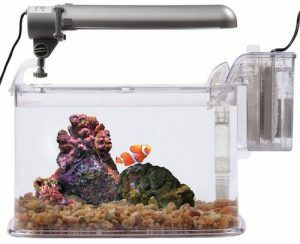 If you’re looking for something very small, not too cumbersome, and easy to manage, this Fluval aquarium is a great place to start. It’s a small cube exactly 7.25 inches long, 9.25 inches wide, and 10 inches tall giving it a nice, moderate size that doesn’t take up too much room. The two gallons it holds circulates at 40 gallons per hour to keep it a clean and healthy environment. The filtration components are craftily concealed from view with frosted glass, keeping the aquatic life the center of attention. The filtration system that it hides has 3 stages that keep toxins out with a combination of coarse foam, carbon, and Biomax. It’s fully integrated in the back of the aquarium for easy access should you need it. Some things to keep in mind, however, is that this is a small device which means the pump and filtration system is going to be a bit weaker than larger systems. It can also create a current that can make life a bit difficult for some smaller fish but it works perfect for various types of slightly larger fish. As a 2 gallon aquarium for sale goes, this isn’t a bad place to start. 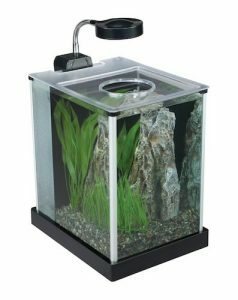 This is a quiet little cube of a 2 gallon aquarium that is perfect for any desk or small corner of your house or office. It’s 8.2 inches by 10 by 10.5 inches and weighs just under 4 ½ pounds. It comes with an LED light and a built in water filter to the rear of the tank, which is well concealed by design. The LED bulb has a bright power that shines right through the clear plastic of the top and illuminates the aquarium perfectly. The filter to the back is Quiet Power and integrated seamlessly into the design of the overall modern design of the small but happy little cube for your fish. There is a square opening at the top of the tank that allows for some dust particles and foreign bodies to get into the water but it’s nothing that the filtration system can’t handle. You’ll also want to turn down the output current during the day as it can be a little strong for some fish but on the whole this is a solid little tank for your fish friends to live in and thrive. This is a uniquely designed 2 gallon fish tank in our list. Unlike the 2 gallon fish aquariums above this isn’t a desktop design, modern cube tank at 11 inches by 8.3 by 4.7 inches though it does weigh a light 4.1 pounds. It comes with a long design fluorescent lamp and the filtration system in plain sight for those who don’t need to meet any sort of industrial modern aesthetic with their small aquariums. The lamp (a Dual Reef) provides up to 7400k of daylight to one half of the tank while the other half gets up to 140000k of true actinic blue, giving both illumination and calm to your fish in their home. The filtration system is a Rapids Mini Power that cleans at 80 gallons per hour and purifies the water in which your fish live. The entire view is clear all around thanks to acrylic construction. 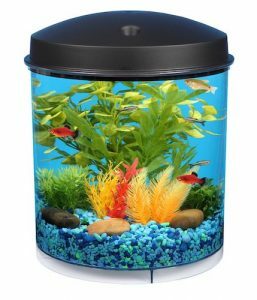 This isn’t the tank for a sleek desktop environment, so if you’re looking for something with a bit more of a streamline design and a modern aesthetic in mind this probably isn’t the 2 gallon fish tank for you. But for any home décor, this is a great choice for any type of small, household fish. This is another 360 designed, vertical tank but it has a bit of a better-rounded shape to make room for more fish to call this tank home. It measures 10.2 inches by 10.5 x 10.2 inches all around and is designed for freshwater fish. Its shape makes it perfect for a dorm room or office, as well as anywhere in your home. The Superclean internal filter cleans and purifies the water at a 45PGH rate while the Bio-Chem Zorb 10 filter cartridge takes care of discoloration and odors in the water. The LED light is energy efficient and offers an array of color options for the tank from amber and aqua to purple and white. The design itself is child friendly a beautiful clear acrylic that allows for a perfect view all the way around. The one draw back is that this isn’t a tank meant to be used for several years on end so if you’re looking for something that can last you through several generations of fish, you might want to spring for something a little bit higher end. But for those looking for some temporary companionship of aquatic life, this is a great choice. You’ve got a whole spectrum of options above from sleek designs to traditional looks to space savers. 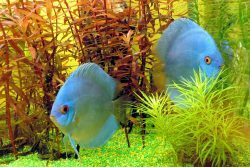 Any of the above 2 gallon fish tanks for sale will serve as a great home for your fish but you’ll want to do research on just how to best craft a home for your fish for 2 gallon tank, whether they be goldfish or shrimp and snails, freshwater fish or saltwater. 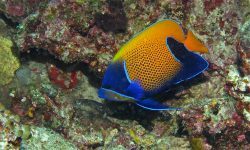 We hope this buyers guide helped you to choose on or more of the best 2 gallon fish tanks we outlined. As always, please let us know in the comments your experiences or thoughts.